﻿As I drove up to Hauppauge High School for the Rolling Thunder Invitational, I was excited to participate in my first track meet along with Elijah. I would have loved to participate with Zachary as well, but his growing pains have him in an immobilization boot until his tendons and ligaments catch up with his growth. I run in different 5K’s and noticed the Green Singlets of Rolling Thunder Track Club. They have an incredible club which includes many nationally rank runners and many run in the Special Olympics. Each member of their club has so much heart and we can all learn so much from them. Elijah brought home a silver medal in the Long Jump, silver in the 400m and gold in the 200m. As for me, that is an entirely different story! As I waited for my 400m race, I noticed 2 guys that were older than me. Ok, maybe I will come home with something, but then 2 other people handed in their stickers to run. Maybe I can come home with something now? A few minutes later, I lined up in lane 6 and waited for the starting gun to fire. The official says, “On your marks” and I hear a pop. I ankle tried to hold but, but after 25m, the horrified look on my face was seen by all, especially by the others on our Track Team! All I could do was shake my head as 4 other runners pass me with ease, about 75m, the person in lane 5 stopped and I passed him, but I still was so far back. There was no way my legs could move that fast! During the final stretch, I noticed Zachary up in the stands cheering me on and watch me come in 4th by default. By the time I got to the finish, I think my heart was about to jump out of my chest. My next race was the 1500m, which had me line up with Coach Brian and another parent, along with other Rolling Thunder runners. After 2 laps, 2 Rolling Thunder Runners lap me. After 4 laps, I was again crossing the finish line last with my lungs about to explode. I probably had my fastest mile, but I will check out the results as they are posted. While I ran about 4.5 miles in the morning with Irene, I don’t think any amount of running would have helped me gain entry to the podium. It was a learning experience, and I know I will be doing more intervals with Elijah at the running club! More importantly, Elijah is having so much fun and becoming very comfortable with running and competition. 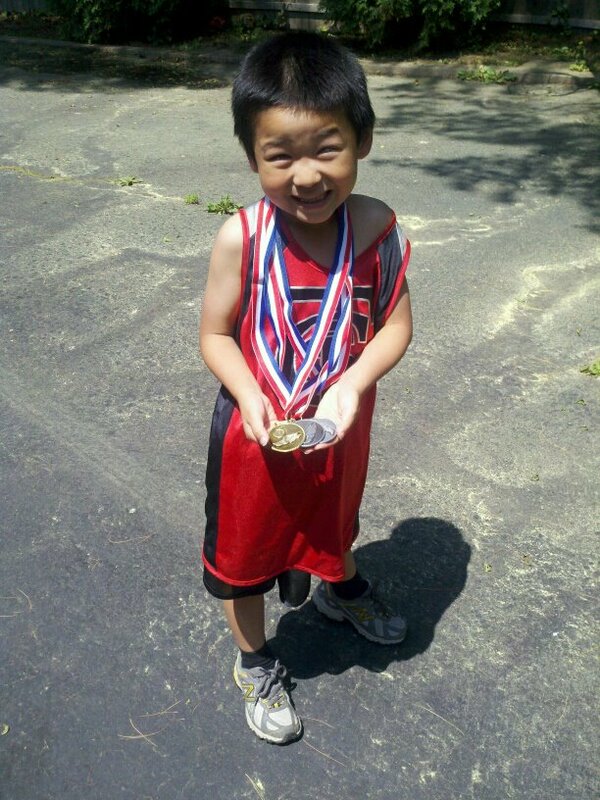 Zachary is anxious to get running and catching up the medal count with his brother! Wow, My Daughter Actually Pays Attention!